Michaela Hodge, a budtender at All About Wellness, said taxes from recreational sales increased prices on eighths of an ounce by about $5. No one stood outside All About Wellness some 30 minutes before the 19th Street Sacramento dispensary started selling recreational marijuana for the first time. Declining to give his full name, Gremmi was unsure of what he’d buy. He just knew he’d get something. It was possible he or anyone could have purchased cannabis grown in Nevada County at the dispensary. Hezekiah Allen, executive director of the California Growers Association, said a local grower could have sold marijuana to a medical dispensary before New Year’s Day — the first day of recreational sales. That dispensary, if it obtained an adult-use retailer license from the state, could then sell that product recreationally. However, the days of that scenario are numbered — and not because of the Thursday move by U.S. Attorney General Jeff Sessions to revoke an Obama-era cannabis policy. A licensed dispensary can only buy from licensed growers. Nevada County has no licensed cultivators because its grow ordinance forbids commercial activity. Local growers can’t get state licenses because of that ordinance. That means once a dispensary sells all its Nevada County product, there won’t be any more. “It’ll be very difficult for new growers to break in,” Allen said. Phil Blurton, owner of All About Wellness, has operated his medicinal dispensary about eight years. He figures about 75 percent of his flower, also known as bud, came from Placer and Nevada counties. He now can get marijuana from neither. Kimberly Cargile — executive director of A Therapeutic Alternative and a board member of Nevada County Wellness, the latter of which applied for a medicinal dispensary in Nevada City — shares that problem. Her H Street Sacramento facility has operated for about a decade. She estimated that 10 to 30 percent of her cannabis has come from Nevada County in any given year. 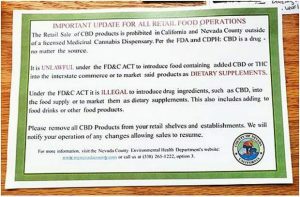 If given the opportunity, Blurton said he’d again buy from Nevada County growers. Cargile isn’t sure. Anyone getting into the cannabis business — grower, retailer or otherwise — will have license fees to pay. Capital costs are another hurdle, as are taxes. Blurton said he must pay over $100,000 a year for his state and local licenses. Sacramento charged him $42,600. The state license is $72,000. A retailer making over $4.5 million a year must pay $72,000 for the state license. Someone making up to $500,000 would pay $4,000 for the same license, said Alex Traverso, assistant chief of communications with the state Bureau of Cannabis Control. In comparison, a beer and wine retailer pays $283 for an annual state license. A store with liquor sales must pay $646. “It’s a little disturbing the amount of money the city and state are requiring for businesses,” Blurton said. Growers face state license fees as well, though it appears local cultivators would pay significantly less than a retailer. Draft recommendations for a new Nevada County grow ordinance call for allowing three license types — specialty cottage, specialty and small. Prices for state licenses differ depending on outdoor, indoor and mixed light. Specialty cottage outdoor, a maximum of 25 plants, would cost $1,205. Specialty outdoor, 5,000 square feet or 50 plants, would be $2,410. Small outdoor, 5,001 to 10,000 square feet, would cost $4,820. Those costs don’t include any fees Nevada County would impose. The price of any local fees remains undecided. 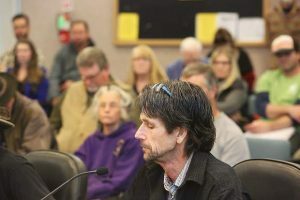 Nevada County supervisors this Tuesday will examine recommendations for a new grow ordinance developed over several months by a citizen’s group. Previously setting March as a goal for approving a new ordinance, county officials have since said they’ll likely miss that deadline. 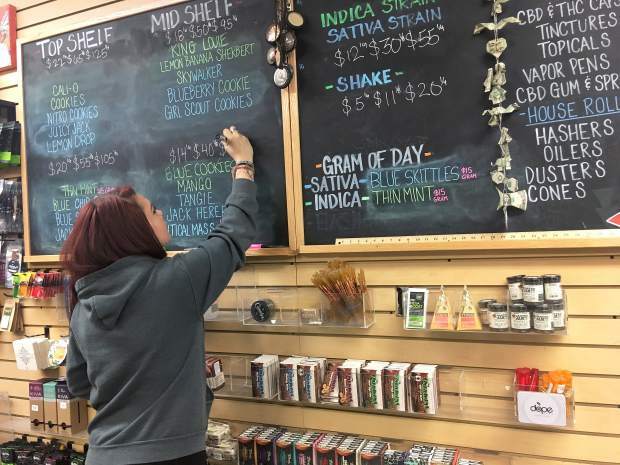 A delay until April or even June doesn’t significantly bother members of the Nevada County Cannabis Alliance’s executive board, though Cargile’s comment — that she would forego local growers if her dispensary builds relationships with others — is concerning. “We’re at a disadvantage here in Nevada County because we don’t have a licensing system yet,” said Maria Herrera, the alliance’s communications director. Jonathan Collier, a member of the alliance’s executive committee, said Cargile’s comment shows the competitiveness of the emerging, legal cannabis market. Many want their products to reach market first. However, that doesn’t mean those who come second or third stand no chance. Convincing county officials to have an open registration immediately after passing a new grow ordinance would help locals, said Diana Gamzon, the alliance’s director. Growers could register with the county, giving them local authorization and enabling them to apply for a state license. County officials would then spend the following months developing their permitting rules, streamlining the application process, Gamzon said. Education, and a savvy business sense, is essential to success, all three said. Collier said growers must become and act like professional businesses to succeed. Herrera said the growers that survive will be the ones who view their garden as a serious business. “If we don’t operate professionally, we will fail,” Collier said. Last Thursday U.S. Attorney General Jeff Sessions reversed a 2013 policy that called for the federal government to take a hands-off approach to cannabis in states that had approved it. Long an opponent of marijuana, Sessions has opened the door to federal prosecutors who want to pursue marijuana-related charges. Executive director of the California Growers Association, Allen in an email said he was surprised it took this long for Sessions to revoke the policy. Lori Ajax, chief of the state’s Bureau of Cannabis Control, said in a statement that California officials are talking to other states in the wake of Sessions’ action. The U.S. Attorney’s Office of the Eastern District of California in a statement noted that growing, distributing and possessing marijuana is a violation of federal law. Sessions’ announcement came three days after Gremmi, the first adult-use customer at All About Wellness on 19th Street in Sacramento, walked inside the squat building. Six others followed him inside and an unknown number across the state, spending money that a study released last year said could reach $5 billion annually. Gremmi spent about 10 minutes before leaving, legal product in his hands. “I just got strong (stuff),” he said.